http://www.recipecommunity.com.au/pasta-rice-dishes-recipes/non-fried-fried-rice/134448 Yummy …. This very popular recipe from the community is great because we didn’t have to cut anything up or stir anything or stand by the stove. And it’s not fried, it’s steamed so less oil and healthier. 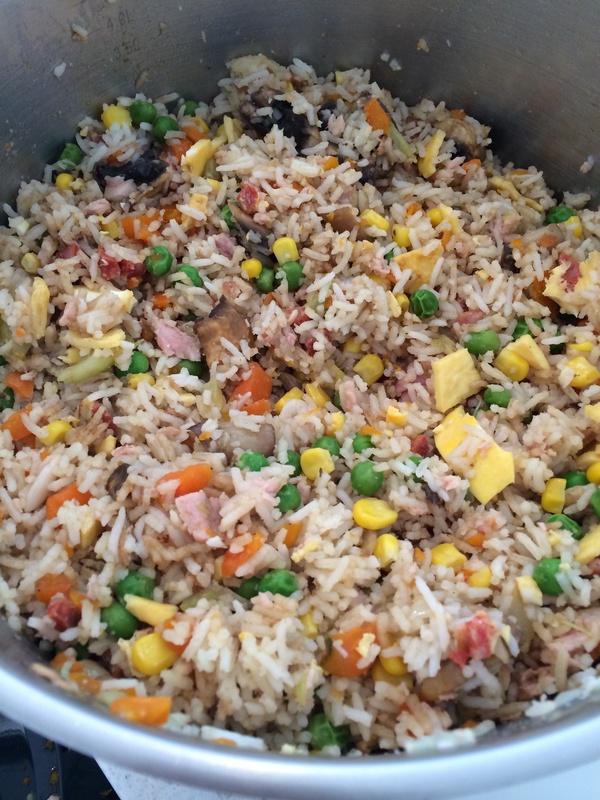 For us fried rice is a regular meal so to find a supremely simple thermomix recipe is exciting. The thermomix cut up the onions and garlic, cut up the bacon, cut up the vegetables, cooked the eggs, veges and the rice at the same time. All you have to do add some cooked chicken ( here’s another use for the shredded chicken made and posted a few days ago) Flavour with salt and pepper, soy sauce , oyster sauce and it’s ready to eat. I added some chorizo to the eggs for a little heat and spice and used about 1000g of luke warm water to make sure the basmati was properly cooked. Total cook time about 25 minutes for this recipe but in that time you can wash up or read a book or even go for a walk while it’s cooking. Awesome definately lives up to the 157 positive 5 star ratings and rave reviews. Post note- tastes even better the next day! < Previous The Bestest Bread Rolls ever! !